Happy Friday sweets! Hope everyone had a fabulous week! I think I'm finally pretty much back into the swing of things from vacation even though I am still definitely missing that Wisconsin weather. Not to mention the food and the beer :) Although I'm pretty sure if I was up there any longer I would have come back at least 5-10 lbs heavier so it's probably a good thing. I have a few things planned this weekend but I definitely plan on relaxing and catching up on my sleep mainly. But until it's weekend time, let's jump into my Friday Favorites with Amanda! 1 // I've been obsessed with lapis lazuli for as long as I can remember, probably mostly because it's my favorite color and it has a hint of sparkle in it. So when I saw Kendra Scott added lapis to their fall collection (as well as a gorgeous granite) I immediately wanted every piece. Obviously that isn't an option so I'd settle for this gorgeous ring. 2 // These are my new favorite jeans under $100! I love the hint of stretch without them stretching out easily and they're super comfy. The hint of distressed makes them great for dressing up or down too. 3 // I received the Bite Beauty Multisticks from Influenster and at first I wasn't so sure about them but they've definitely grown on me. The Cocoa color is a great eyeshadow color that goes on creamy and doesn't crease and both the Blondie and Macaroon colors are perfect for lips and cheeks! I love that they're lightweight, but still provide a lot of pigmentation and have a great staying power. I put the Cocoa color on at 5:30 am before hopping on my plane last week and it was still going strong when we headed to the football game at 7 pm that night! 4 // At the risk of sounding like a broken record, I am SO ready for fall weather. It usually doesn't get really cold down here in FL so most of the fall/winter I can get away with a heavier cardigan and I am loving this one! The chunky weave, the tassel trim; all perfect! 5 // Speaking of fall (sorry, not sorry) DV does it again with their Target line! These peep toe camel colored booties are the perfect transition booties from summer to fall. Now why can't they have them in my size?! Lots of fun favorites this week! My favorite is that cardigan- those tassels make it! Have a great weekend! I'm with ya girl, so ready for fall weather! Those shoes look like the perfect transition too :) Have a great weekend! Those peep toe booties are perfect to transition into fall! Love all these picks! 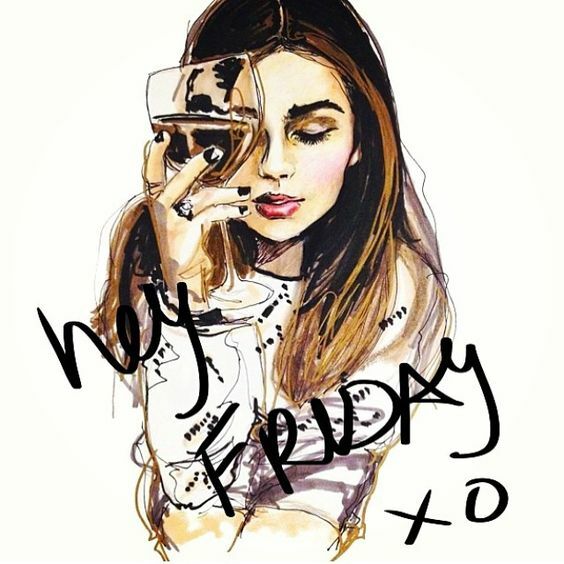 Have a fabulous weekend girl! seriously give me all the fall! who cares if you sound like a broken record haha. those booties need to be in my life. and that ring! you need it. it's def a perfect statement piece! happy friday love! what a gorgeous ring! I love lapis lazuli too! :) Happy Friday! So many great things. I love the lipsticks from Bite. I have a lip crayon and love it. That stuff doesn't move. The only downside is it is a bit drying so I always have to use a bit of gloss. Have a wonderful weekend pretty lady. YES girl, I'm SO ready for Fall! The cardigan is perfect...love it so much! I saw those booties at Target and they are gorgeous! But they just looked so weird on me. Haha! I hope you have a great weekend! You can never talk too much about fall! There's been a little chill in the air in the mornings here recently (and by "chill", I mean it's like 73 outside instead of 80+) that has me so ready for fall to officially be here. Those shoes are to die for... and TARGET!? Oh my gosh I'm obsessed! I love Blank's jeans. I have to add this pair to my wish list! Are they a higher rise or lower? Hope you have a great weekend! That lapis is realllly pretty! I can see why you are lusting after it! Welcome back! Loving those jeans and I think I need those booties! And yes!! So over this heat, it's enough already! I saw the Bite Beauty sticks but wasn't sure... Thanks for the review! And that ring! Anything with UK blue in it usually makes its way into my closet. :) Happy Friday! I tried on those booties at Target the other day and they hit a little too high on me for my liking which was so sad! But I easily found another pair from their DV line that I want so there's that! Jeans that stretch without stretching out can be so hard to find- definitely going to check out the ones you listed. That ring is so gorgeous-- love that blue! Ahh those BOOTIES. Love love love. This week was my first week back at work after being on vacation so I know how you feel!!! I love those booties and that cardigan too. I hope that you have a fab weekend! those booties!! go target. and that ring is gorgeous - you definitely need it. hope you are able to catch up on sleep and relax this weekend! You would've loved the weather here today - high of 73! :) Off to check out those jeans - happy Saturday! I love Blank NYC jeans as well, the fit is always so spot on! I'm also obsessing over those booties from Target...so chic! I'm loving everything from the Fall KS line too! The colors are just so pretty, and I love the arrowheads too! Why can't money grow on trees so we can get everything we want!